Watermelons are exploding in China creating “fields of landmines” as described by the state controlled media. The exploding watermelons are caused by misuse of the growth accelerator forchlorfeneron by newbie Chinese watermelon farmers, where skyrocketing prices have caused a rush to harvest the popular summertime fruit this year. Not surprisingly, Chinese regulations (they have some?) don’t forbid use of the chemical (yes, our plants are drugged too). Misuse of pesticides, fertilizers, and chemicals appear to be rather common in Chinese farming with unusually wet weather this spring serving to blow the whistle on this particular abusive tactic. This same drug is permitted in the US on kiwi and grapes. 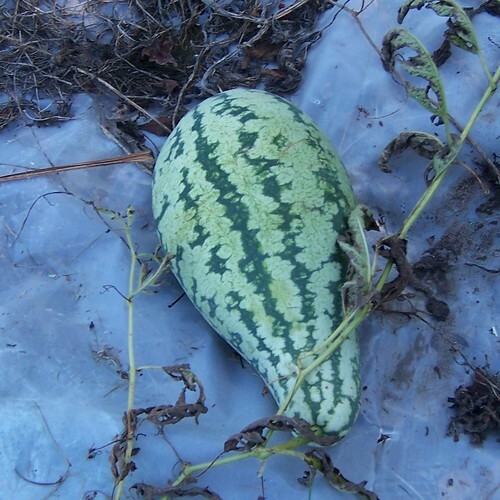 Signs that watermelons have had forchlorfeneron used on them include fibrous or misshapen fruit with more white seeds than black. No worries, though. The Chinese farmers are making lemonade out of lemons with their exploding watermelons that can’t be sold at market. They are simply chopping up the ruined, toxic fruit and feeding it to fish and pigs! What else would you expect from a country that genetically modifies cows to produce human breastmilk, for heaven’s sake?